I went over to the surplus shop earlier this week to get some wool blanklets, but ended up buying myself a nice new, well new to me, surplus Long Back Bergen in OG. 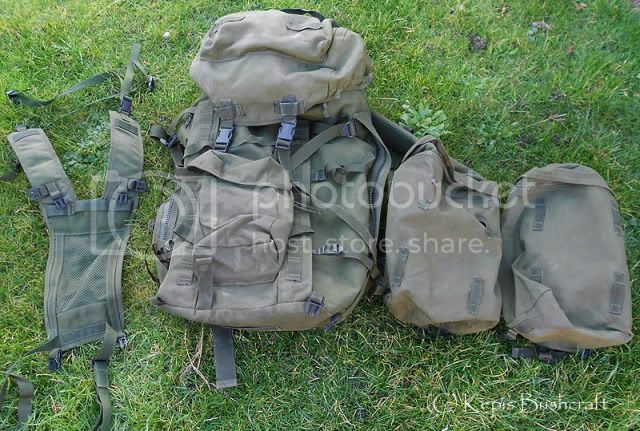 I've been looking at one of these packs for a little while for transporting timber back from my woods, as I'm always fearful of ripping my Sabre packs that i currently use and a surplus Bergen is going to be one heck of a lot cheaper to replace than a Sabre 75. The extra capacity of this pack will also allow far easier transportation of gear when the boys and i go for a weekend away as they only have relatively small packs and during the cooler months of the year, their packs are a little small for their winter gear, and lets face it, just because this is a 120 litre pack, doesn't mean it has to carry 120 litres of gear. Looks to me like you have Purchased a Fine piece of Kit!!! I was Just in an Army/Navy Surplus Store yesterday pricing Packs, and they can get mighty expensive. The Maxpedition I was looking at ran about $140.00. I think you did well, and didn't break the bank either! They are superb packs, if you get stuck and are willing to pay the cost of goods and postage to the US, im happy to go get one for you. Thanks Kep,and I'll keep that in mind if I can't find one here! Looks like it's in great shape. Should hold up well. Looks like a lot of cubic inches too. I would love to get one of those one day. That is a nice pack. I like the bombproof packs.